Dr. Hunter graduated from Emory University School of Dentistry in 1981 and has dedicated his professional career to providing patients with outstanding care. He has devoted his Dental Practice to restoring and enhancing the natural beauty of your teeth. 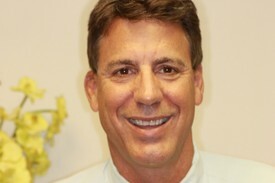 He is a member of the American Dental Association, Florida Dental Association, and Greater Orlando Dental Association. He is also on the board of the Orange County Dental Research Clinic. Dr. Hunter is continuously participating in advanced training and continuing education courses including specific training in porcelain veneers. Dr. Hunter’s passion involves doing Dentistry in third world countries. He has traveled to India, Honduras, Guatemala, Peru, and Dominican Republic. Dr. Hunter feels he has been blessed in life, and firmly believes in giving something back. He also participates in local charities, including the “Give The Kids A Smile” program, United Dental Charities, and each year he gives away thousands of toothbrushes. He wants you to know that part of every dollar you spend at Dr. Hunter’s office goes to funding a future mission trip. Dr. Hunter and his wife, Jill, have two daughters, Katie, and Ann. He enjoys kiteboarding, surfing, mountain biking, snowskiing, and scuba diving.